This Round Stool will make a great addition to any dressing table. The Bermuda Bar stool is a Stylish, modern, attractive and elegant bar stool. The beautifully crafted and good looking chrome frame and base will blend in perfectly in your contemporary kitchen setting. the soft padded seat ensures you dine in comfort and luxury. The contemporary and robust S Shaped Bar Stool Model 6 in a Beech or Walnut seat and Chrome finish is a sleek looking piece that has been styled to fit a contemporary home, with Deep Seat and Foot Rest which gives this stool great comfort and allows you to maintain good posture.Available in different colors. Sold in Pairs. The Bowden Bar stool with faux leather seat and high back rest. 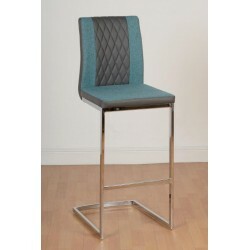 This Barstool is foam padded for extra comfort and sits on a sturdy chrome base which is hydraulically adjustable. 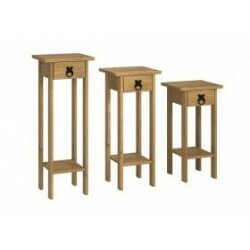 The stool is available in Black Colour only. Sold in Pairs. The Bar Stool Chrome Model 7 with faux leather seat is foam padded for extra comfort and sits on a sturdy chrome base which is hydraulically adjustable.The stool comes in a choice of either black or white. 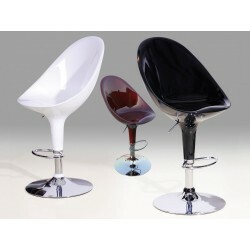 The Bar Stools Chrome Model 1 is a beautiful representation of the quality. It is crafted from the highest grade Plastic and Chrome with Gas lift mechanism giving you real durability.This bar stool is designed to fit into a contemporary themed setting. Available in different colours. Sold in Pairs.